The classic combo of Campari and grapefruit meets with a handful of fresh mint for this undeniably refreshing palate cleanser. Be sure to scrape the frozen ice crystals as directed for finely textured ice. Stir together the sugar, chopped mint, grapefruit zest and water in a saucepan. Place over medium heat and bring to a simmer, stirring or swirling the pan until the sugar is completely dissolved. Remove from heat and let steep for 5 minutes. Stir in the grapefruit juice and Campari. Strain the mixture through a fine-mesh strainer into a 13-by-9-inch glass dish, pressing on the solids to extract all of the flavor. Discard the solids. Freeze until thickened and slushy, about 1½ hours. Remove the dish from the freezer, scrape the surface and sides of the mixture with a fork to break up any clumps, and return the dish to the freezer. Continue to scrape every 30 to 60 minutes until you have a pile of light, icy slivers, about 3 hours total. Spoon the granita into chilled martini glasses and top with a fresh mint sprig. As you complete each glass, refrigerate it until all of the servings are assembled. 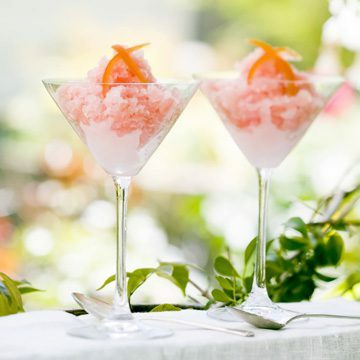 When they are all ready, serve immediately as the granita melts quickly. Freeze leftover granita in a tightly covered plastic container for up to 5 days. It will become more compact over time, but the flavor will be just as lively. Fluff with a fork before serving.